A little off the beaten path… We were passing thru the area and decided to get off I-66 and check in for the nite. We had heard that this particular campground was rather nice. Got off I-66 (exit 6) and traveled south on US Route 340 several miles. About a mile past the Shenandoah National Park entrance was the entrance to Front Royal RV Park. We’re here! Not quite… we continues up a long, narrow road (we’ve got a rather large Class A and were nervous about meeting another Class A going in the other direction) for what seemed like a mile or two and here we are! This campground has about 150 sites although it didn’t seem like there were too many for larger rigs. It was a tight squeeze for us. Our site was fairly close to the main building and pool. Full hook-ups were available (20/30 amps) at about 1/3 of the sites. We were just passing thru so we really didn’t have much time to tour the park and take advantage of all the amenities, but it looked like they had a good mix… The pool was nice and they did have a very nice water slide that we did get to use. They also have a small mini-golf course that was fun. The camp store was small but they had a good selection of camping supplies and groceries. We would have liked to stay a bit longer but we were off the next day for Pennsylvania. This campground looked like a nice place to get away from it all… it was just remote enough to make you feel like you’ve left the rat race behind. I definitely would stop back again it we were in the area. It is a very tight squeeze for larger rigs. I had a truck camper so I stayed in the wooded area. I had a hard time leveling the truck and had to sleep on a slant. The wooded area is beautiful, but very crowded. 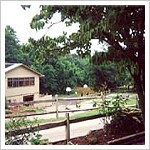 It’s a great place for kids with the pool, slide, and rec building. The night I stayed there was a DJ in the rec hall, and a pancake breakfast in the morning. The park didn’t have a get-away-from-it-all feeling because there were just too many people. I was there in August, so maybe the off-season is a little nicer.